You have WordPress installed and now it is time to start styling your fashion blog. You may have noticed that WordPress comes with a default theme installed; though, if you want your fashion blog to stand out, it will help to take a look at some other themes. Below, you will find my list of the top 5 free WordPress themes for your fashion blog. These WordPress themes are all free and receive regular updates – which means that you shouldn’t run into any compatibility issues with plugins or the latest WordPress features. When you are working on a fashion blog it is important that your blog makes a splash. As the name implies, Stylish provides plenty of style for making your own WordPress fashion blog. Advantages: Stylish has several benefits, including a large stylish layout. The top of the homepage includes a responsive slider that can include your featured posts. The cool backgrounds help make this free WordPress theme more colorful and vibrant. Overall: Stylish is a free responsive WordPress theme created for fashion bloggers, but it does include sponsored adds that cannot be removed without purchasing the premium version. 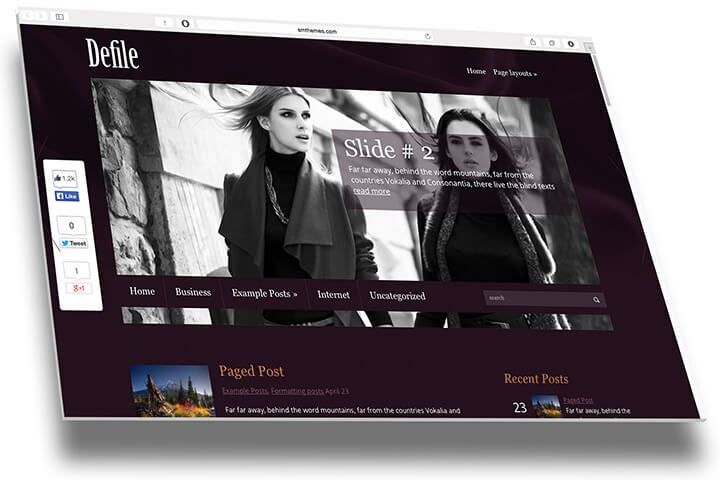 Defile is another free WordPress theme designed for fashion bloggers. It includes a dark layout with a large homepage slider for showcasing your featured posts. Advantages: Defile has a clean look and includes responsive design. It also has custom sidebars, a social media sharing widget, and a related posts section at the bottom of your posts so that readers can quickly find more articles to read. Overall: Defile is attractive and easy to customize. The included options allow you to change the background and color scheme to suit your style. Bandana is a popular free WordPress theme for blogging about fashion. With a large featured image at the top of each post, this theme lets you show off your fashion images above each post. Advantages: The main advantage of using Bandana is that you can customize it however you see fit. Add your own custom background, edit the layout, and add sidebar widgets. Overall: Bandana is one of the more traditional magazine style themes in this list of top WordPress themes for fashion blogs. It is not ground-breaking, but it is suitable for building a quality fashion blog. Queen has a feminine appearance; though, it does also include customization features to alter the look of your blog. It includes custom widgets and drop-down menus. Advantages: With a simple slideshow, Queen is another stunning modern WordPress theme. It comes with fancy menus and other flare that should appeal to your visitors. Overall: Queen is a well-built responsive WordPress theme with custom widgets and short codes. Overall, this is a lightweight theme that should result in fast loading pages. The final WordPress theme in this list, Clutch is probably the most original. It’s unique slider for the homepage is modern and trendy, providing a great spot for showing off your latest posts. Advantages: Clutch is a perfectly designed WordPress theme, so you should not run into any compatibility problems. It’s best feature is the unique slider on the homepage, but it also has custom widgets, short code, SEO optimization, and supports Woocommerce plugins. Overall: Clutch is an attractive and original free WordPress theme with a variety of options for customizing the overall look of your fashion blog. Check out the live demo and decide if it is right for you. These free WordPress themes all provide a good structure for creating your own fashion blog, but you should still consider installing a premium theme. If you have a question, send me a message using the form below and I’ll get back to you as soon as I can. Hi! I appreciate you taking the time to write this. I am more interested in the premium as the security with more features appeals to me. Do you feel that WordPress does well with a lot of traffic, on mobile devices and ease with advertising? Just starting out but I’m learning a lot about affiliate links as well as advertising with making money. Any insight that you have for me would be great. It will be a fashion blog 🙂 Thanks! Hey! Thanks a lot for the knowledge. The question is, I’m new to it and I wonder where to get these themes working on my blog from? Would love to hear back soon. Hey, dear, Fantastic experience after learning your amazing blog. I am glad I have found this amazing fashion theme blog.